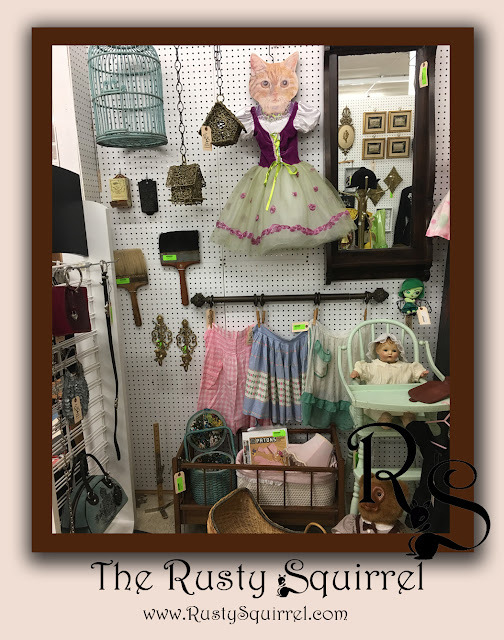 Hey All - I've been a busy girl getting my booth set up, keeping it stocked and traveling to find more cool things for my space at the Antique Mall in Siler City, NC. So a brief run down of what I've been doing - Back in May I moved into showcase #21 at Countryside Collectibles & Antique Mall in Siler City, NC and then in June I started moving items into booth #48. Week by week I've been adding and moving items around as things have sold and with it being summertime I've been traveling quite a bit to find more whimsical items to bring to the booth for sale. 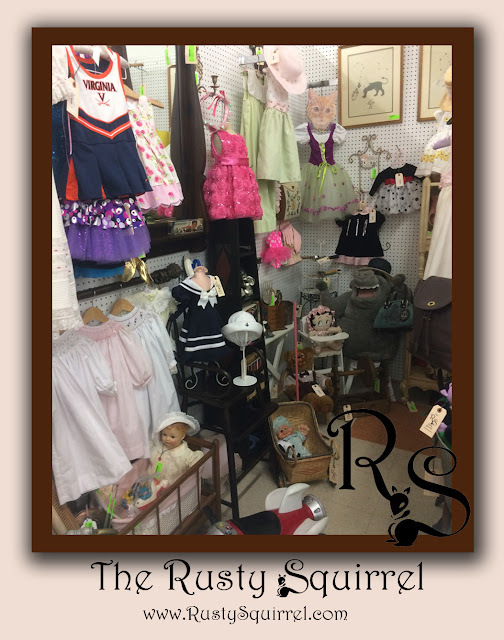 I like to keep a mix of Vintage, Collectible and Whimsical to keep my space interesting to shoppers of all ages. Earlier this month I came across this amazing laundry wringer from the early 1900's and had to have it for my booth. 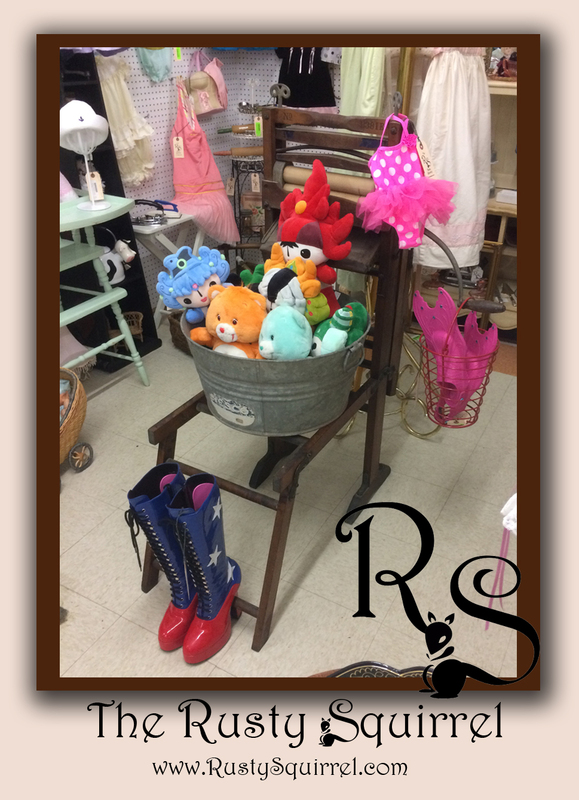 I already had the vintage galvanized wash tub and knew the wringer would make an amazing display prop in my booth. I had to pay a whack for it, but I really want to keep this item a while so it would take the right buyer to come along for it. I wish this awesome pair of Red, White and Blue boots had been my size. They just screamed Wonder Woman costume to me and I knew someone would snap them up. They sold within a week of being added to my booth. I'm starting to get my bearings on getting things organized in my booth and it can be a daunting trial to keep it well stocked but not too cluttered. I figure it will take a bit longer for me to master this but I'll get there eventually. 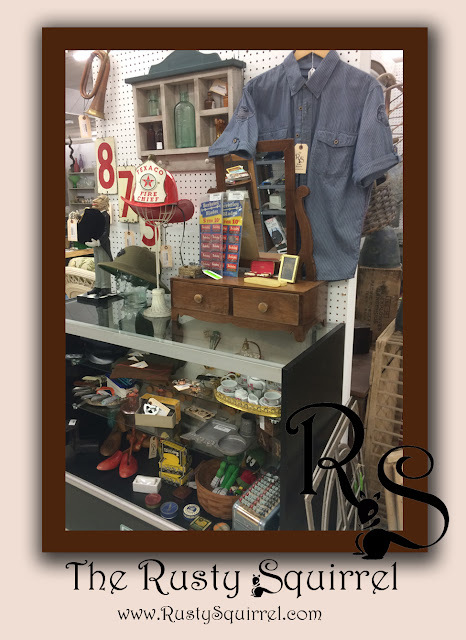 I've been making one trip a week up to Siler City to add and re-arrange items in my booth and showcase. It's an all day affair when I go up and I've been limited to one load of product each time I go. I currently have both booth and showcase fully stocked but the first few weeks involved taking up larger display items so I felt the booth looked a bit bare to the bones as seen in this earlier photo from the beginning of June 2017. As you can see I was gearing up for the Fourth of July with Red, White and Blue as well as Patriotic and Bicentennial Items. My Favorite items in this image were the two 1976 cast metal soldier wall plaques made by Sexton. One represents the Colonial Continental Army and the other is a Colonial Minute Man. Both sold before the 4th of July as did the great Mid-Century yellow folding picnic table by the Handy Milwaukee Stamping Co. I bought it as a display piece since it would give me a lot of surface display area and then it folded into a self contained carrying case for storage. My hubby thought I'd have it a long time; but my display piece sold in less than 2 weeks. It's interesting to see what sells quickly and what sits around a bit longer. Those two jumbo vintage paintbrushes went super quick, they sold in a few days. The fish tin match wall safe, Sewing basket, high chair and infant hot water bottle that's on the high chair all sold in under a month of being in the booth. The circa 1920's rubber baby hot water bottle was also a very unusual item and went home with another buyer. I have to admit I'm surprised the blue bird cage and twig bird houses still have not been snapped up. 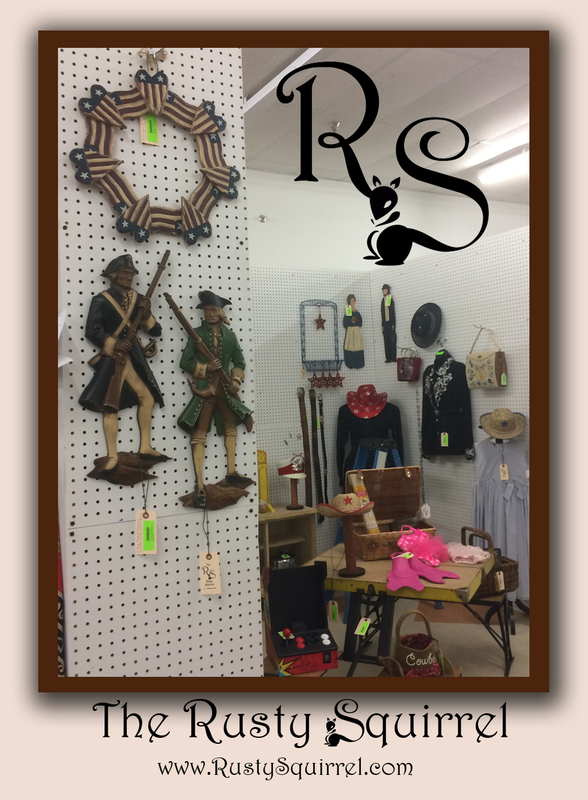 This primitive handmade rifle rack sits in place of my first display shelving unit which was purchased at the end of June. It was a fancy little number with shelves and drawers but I honestly like the rustic feel of this little guy a whole lot and will be using it to help display some vintage tools and bits I have for sale. The yellow toy theater is one of my favorite display items so I hope to have it a while longer; however the 1960s Pelham marionette doll "Gretel" is still looking for a new home. The red cowgirl boots, vintage tools, Brownie box camera and several of the wall plaques have found new homes over the past month. A few weeks ago I rearranged when I took up some more treasures. I've found that quality little girl dresses are a big hit and many of the little girl hats have found favor with buyers as well. The Juicy Purse that the stuffed animal is holding has also been sold, as have several vintage kitchen tools and accessories. The Effanbee baby doll (sitting in the baby doll crib) is from the 1920's and is a rare "Mama" doll. You can feel the Mama sound box still in her but the box no longer works when you move the doll. 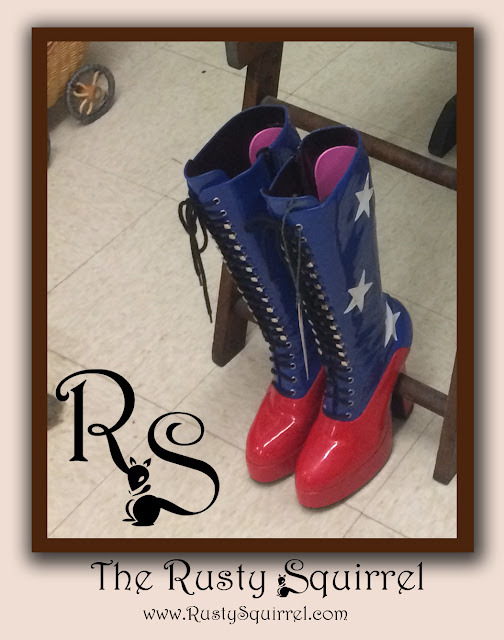 Sadly she had some damage to the top of her composite head and her original silk booties were falling apart due to age; however a collector realized what a treasure and good deal she was and she now has a new home. I also did a major update to my showcase display. You would think a small space would be easy to arrange but I've found setting up the showcase to be more difficult than the larger 10' x 10' booth. I've just not found the magic mix of items to display here. The retro Harley Davidson is a favorite of mine so I moved it from my booth to the showcase to help it stand out a bit more. This striped shirt looks like a vintage mechanics shirt and is just waiting for the right guy or gal to appreciate it's appeal. It's a men's "skinny" XL and a good deal at $12. My hubby will be adding to his wardrobe if it does not find a home soon - grins. The 1962 Christmas Texaco fire chief helmet was a recent find I could not resist adding to the showcase. Age has taken it's toll on the attached microphone; however this heavy duty children's helmet makes a great statement and is a beauty to display. 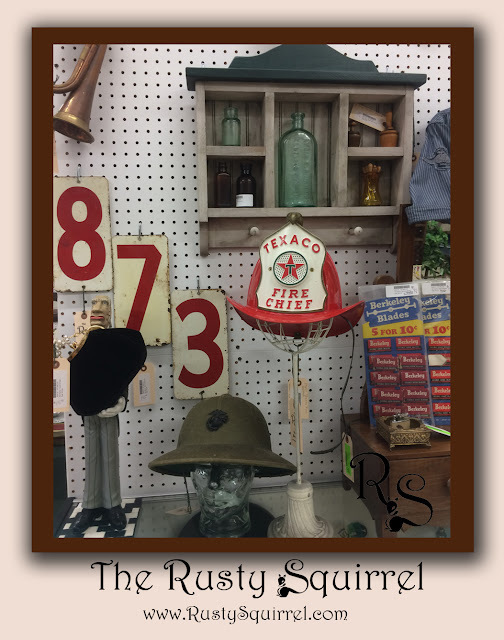 I also have some interesting vintage military hats in the showcase, including this post WWII pith helmet which is taking first honors on top of the case. I think I'll move the wine butler (the guy on the left holding the evening bag) to the booth next week when I go up to re-stock. I'll also add a few more medicine bottles to my bottle display unit and replace some items that sold out of the case. I have an extensive personal collection of vintage items which I can sell; however I was a bit concerned if I could continue to keep a booth supplied with interesting and unusual items at a good price. 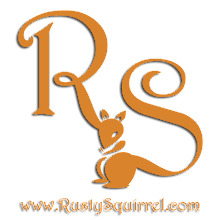 I've been blessed with finding some really lovely items on my travels to add to my personal treasures for sale. These are a few of my recent finds that will traveling up to my booth in the next week or so. An eclectic mix of the Odd, Strange and Beautiful. 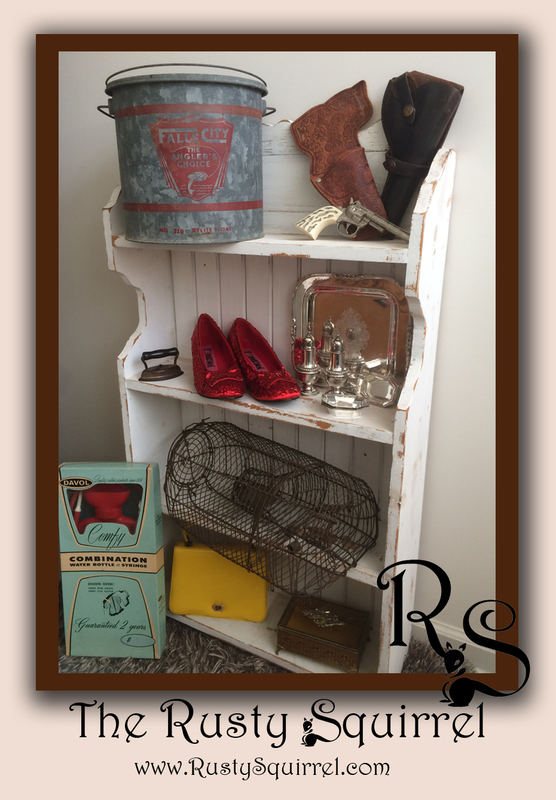 Top Shelf: Vintage bait bucket, vintage child's western leather belt holster and gun, vintage adult gun holster. 2nd Shelf: Antique cuff, collar and ruffle iron, Ruby Slippers, Sterling Silver salt, pepper and individual nut dishes, small silverplate tray. 3rd Shelf: Antique wire live mouse trap/cage - it's one of those cool but creepy contraptions from the turn of the last century. Bottom Shelf: Mid-century hot water bottle in original box (ya, another weird item but vintage items in box still are quite collectible) , 1960s mod yellow purse, mid-century filigree metal and glass jewelry box with gold velvet lining. I thought this was a fun mix of pretty and pretty unusual. Speaking of unusual, while traveling this week my hubby and I stumbled upon the most unusual museum we've come across in a long time. The Belhaven Memorial Museum in Belhaven, NC is a must see if you are ever in the Coastal part of NC around Bath, NC - https://www.visitnc.com/listing/belhaven-memorial-museum. 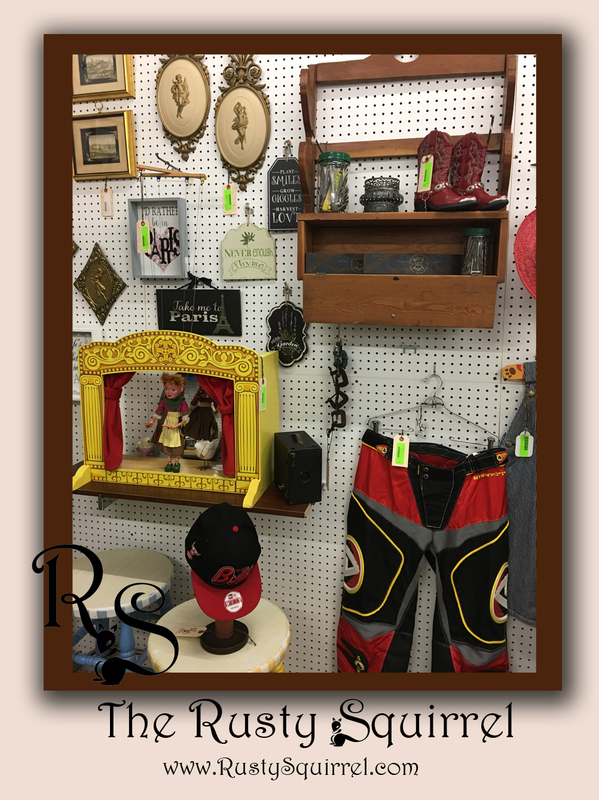 This place has the strangest collection of old stuff you will see in one location. It's shabby and many of the items are withering away as time takes it's toll but it's fascinating to see. There is no entrance fee but donations are welcome. Keep in mind hours are 1-5 pm and they are closed on Wednesdays. I advise checking in advance to make sure they are open before you drive out there.